Over 70 years later, Auschwitz concentration camp remains a haunting reminder of one of the most horrific atrocities in human history. Despite its terrible past, from a distance the sprawling network of concentration and extermination camps look almost unassuming. In fact, at an aerial view, the eerily pristine buildings, fences and courtyards seem like some sort of hospital or factory that's still in use. Comprised of three camps Auschwitz I (the original camp), Auschwitz II (the concentration and extermination camp) and Auschwitz III–Monowitz, (a labor camp), the massive compound was where over one million were murdered, History.com explains. Mass genocide, incomprehensible working conditions and cruel torture were among the many atrocities that occurred behind the fences of Auschwitz from 1940 to 1945 when the Soviet army liberated the remaining prisoners. Though the camp is currently maintained as a World Heritage Site, educating thousands of visitors each year, the mere sight of the camp's vast reach is a powerful and evocative image. 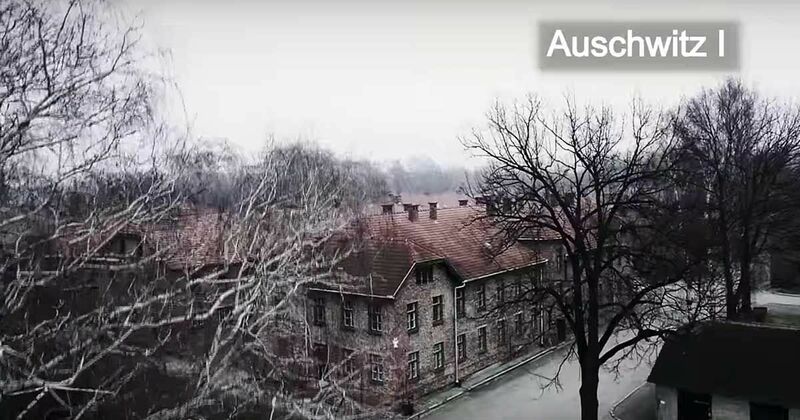 In the video below from BBC, drone footage presents the camp in an almost surreal view, capturing the cold and chilling exterior in a way that few have seen it.